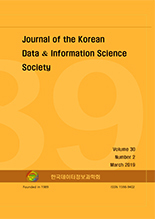 주성분회귀분석(PCA regression)은 과학 및 공학 분야의 응용 프로그램에서 데이터 분석 및 차원 축소를 위한 도구로 사용되었다. 주성분 회귀의 해석과 사용에 대한 많은 논란이 있긴하지만, 회귀모형에서 설명 변수 중 다중공선성 문제가 존재할 때 여전히 유용한 도구이다. 이 연구에서 일반적인 수축사전분포의 사용을 기반으로 한 PCA 회귀에 대한 베이지안 추론을 소개한다. 종속변수와의 선형관계를 고려한 베이지안 정보 기준에 근거하여 주요 주성분의 갯수를 선택하는 방법에 대해서도 논의한다. 실제 자료들에 적용한 예제에서 설명변수의 개수가 관측갯수 보다 많은 자료의 경우 예측의 관점에서 최종모형을 선택하였고, 변수선택에 사용되었던 자료의 경우 이전의 연구결과를 포함한 변수들을 선택하는 결과를 확인할 수 있었다. Principal component analysis (PCA) Regression has been known as a tool for data analysis and dimension reduction in applications throughout science and engineering. Even though there exists controversy for the interpretation and usage of PCA regression, it is still a useful tool when there exists a multicollinearity problem among explanatory variables in the regression models. We here introduce a Bayesian inference for PCA regression based on the use of general classes of shrinkage priors. We also discuss a method to choose the number of principal components considering the linear relationship with dependent variables based on the Bayesian information criteria. Based on the applications to real datasets, we observe that for the data of p >n, the proposed method selects the number of principal component for the purpose of better prediction, and for the data of variable selection, it choose variables include the variables which previous have proposed.